Even the balloons are stretching! 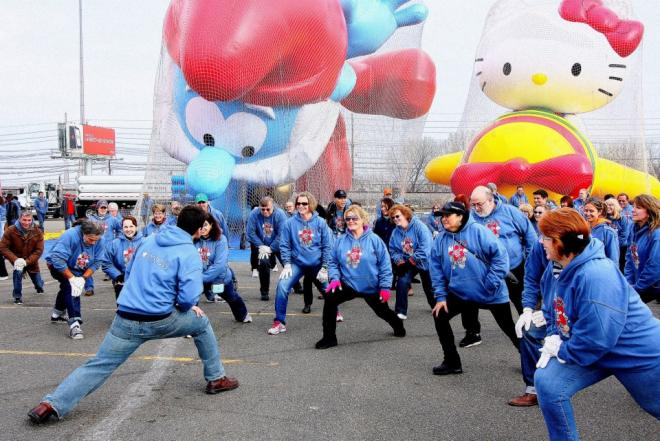 There is just something about the Macy’s Thanksgiving Day parade, now in its 86th year, that gets me excited. Even as I grow older, I still like waking up and turning on the parade coverage – switching back and forth between channels – while I settle down for a leisurely breakfast. Perhaps I like the parade because it is associated with a family feast later in the afternoon. A full-day of football follows the three-hour display of floats, balloons, and performances. Heck, even a dog show annually appears on NBC from 12-2 p.m.
Maybe my interest is simply with the parade itself. I am a fan of the widespread display of optimism, the bundled balloon handlers stumbling down sixth avenue, the elaborate floats crowded with celebrities and musicians, the marching bands, the Broadway music/dance acts – the whole kit and kaboodle. There are not many events associated with pure, unadulterated happiness. The parade is one of them. Now, I’ll admit, I do end up only watching around 30-45 minutes of it (unlike when I was a child) before using the off time to catch up on schoolwork or visit the gym in anticipation of the impending shameless familial gluttony, but I cannot help but smile when I turn on the parade in the morning, and kudos to Macy’s annual event for giving me that every year. Note: For a full list of performers visit Wikipedia. The big musical acts of the 2012 parade are Flo Rida, Trace Adkins, Colbie Caillat, Chris Isaak, Carly Rae Jepsen, and Karmin. Broadway is sending Annie, Bring It On, Elf, Cinderella, and Nice Work If You Can Get It. There are several other acts, though, including two I will choose to feature: Mannheim Steamroller and Don McLean. While Arlo Guthrie is not listed as a performer this year, Don McLean will provide viewers with a live version of “American Pie,” which, like “Alice’s Restaurant” is just quintessentially American. McLean will appear on South Dakota’s float because, why not.